We here At Angel Field will be growing our first Heirloom Potatoes on our farm this year as they did in 1879 when this town was Called Chesapeake City overlooking Fort Monroe. The Potato History is the same as the Polynesian Taro plant root called corm they use to make Poi. Like Mashed potatoes, Poi is a pasty mass made by pounding or grinding cooked taro corms, with a lot of water added to obtain proper consistency. When Europeans and Polynesians Explorers, discovered the potato plant or Taro plant they became the most significant vegetables included in their daily diet, especially the Irish in Ireland potato crops. Realizing the potentials of feeding their families and medical healing properties, cooked in many ways called soul foods. It was the same way with the Natives Americans Winter Squashes Vegetables and especially the Native Muscadine Grape they enjoyed and use as Medicine. Our Muscadine Grape Vine was brought to this historical farming property in 1879, giving as Payment to buy this Property when the City was called Chesapeake City. My husband and I visited many Indian reservations to learn the secrets of making medicine from the Muscadine Grape from Natives Americans, because they taught to the Contraband Slaves and Irish Immigrants their food secrets. We are very thankful to have a pure Historical Heirloom Muscadine Grape Vine. It's our goal to sell clipping by 2016. Our 2015 research goals stared this year with the Hawaiian Natives as we spent many years collecting the secrets food supply knowledge of their historical heirloom plants, and growing out heirloom varieties that are adoptable for the mainland environment and growing zones. Many of Native Hawaiians Vegetables Seeds are not released for sale yet until I learn more about Hawaii Natives and their red clay soil. After Studying at the University of Hawaii about the Native Hawaiians Cancer fighting fruits and vegetables, I have learned that many of their Varieties cannot be grown here in the lower states environment, not even Florida. As the Record Cold this year 2015 has presented itself as “True Evidence” as to why the Morinda citrifolia plant cannot survive in Florida Climate or Growing Zone. The Morinda Citrfolia is called noni fruit, noni juice, Indian mulberry, morinda, hog apple, meng koedoe, mora de la India, ruibarbo Caribe or wild pine By Natives Americans and Hawaiian Natives. The Noni Plant plays a large role in the survival and life style of the Native Hawaiian as the Cushaw Squash importance to the Natives Americans Surivial and Life Styles. In most Native Americans and Hawaiians foods have very high colorful, because as we all know the higher the coloration in our food Source “the higher the antioxidants”. Angel Field’s food history research took place this year at the University of Hawaii. For the last 6 years we only learned the food history from the Hawaiian Natives. This year in February we studies at the University and the Natives Themselves. Especially, learning from the Native Hawaiians Farmers themselves "as I song and dance with them with much Aloha Spirit at their farmer Markets". I interviewed many Women’s Farmers like myself and learned so many secret farming skills, and different uses of historical farming tools. I event took pictures of Chickens waking around the Walmart Shopping center with their own Aloha Spirit. Yes the Chicken greeted me and stops to take a picture. This year we here at "Angel Field Farms" will seek to understand the “Cancer Fighting Fruits & Vegetables research by many Universities across the US on many of the Hawaii heirloom fruits and Vegetables, especially the Noni Plant. But the Hawaiian Natives Knows the Secrets of their Natives Food Supply and will keep these farming and food secrets until they are recognized as Natives Americans. The Native Hawaiian Bill failure was a shocking reality to everyone, even me, that the Bill "did not" pass Congress. I researched this Bill footstep through Congress, with the help of a very nice and patience librarian in Honolulu, and we both cried a little because the Bill would have finally made them Natives Americans, but the Bill fall apart in Congress. The Spirit of the people was very different but they still have the Aloha Spirit. Thanks to the Students and the Hawaiian people with all their help. My ninth grade teaches told me that The Honorable George Washington Carver kept the Natives Americans Farming and Survival Winter Foods Secrets with him. I did not understand what she was saying until 20 years ago while research the Native American Cushaw Squash. 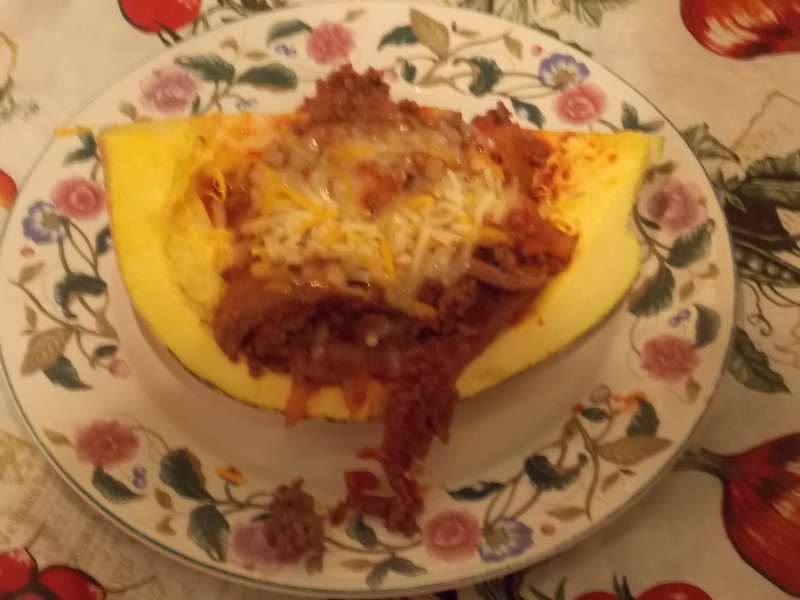 This winter squash was grown on this property and stored at the bottom in a very dark compartment of a handmade china cabinet made by an ex-slave. 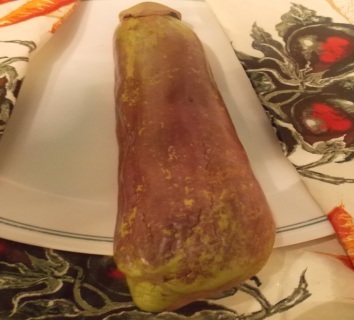 When looking for this winter squash I only had the description of a duck Shaped looking green and white Squash that was about 1 to 2 foot long 20 years ago. Native American told the newly freed people here in Virginia how to use this squash as a survival winter food. If stored properly the Cushaw Squash that had a 18 month Shelve Life. Just think how life was living without the invention of the refrigerator in the 1800’s. Grown in Hot Summer Gardens and Tropical regions because it is resistant to Bacterial Wilt and tolerant to Root Knot Nematodes. 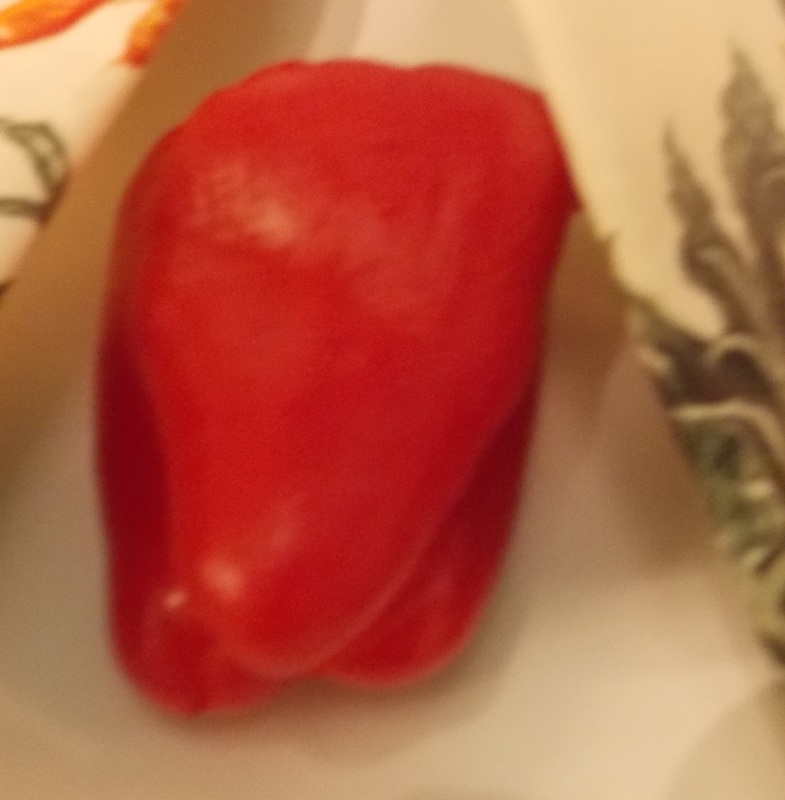 Kaala Bell Peppers are a bit longer than a regular Bell Pepper, but 1/3 wider and colorfully sweet, and will turn red when mature. Matures from transplant in about 75 days. 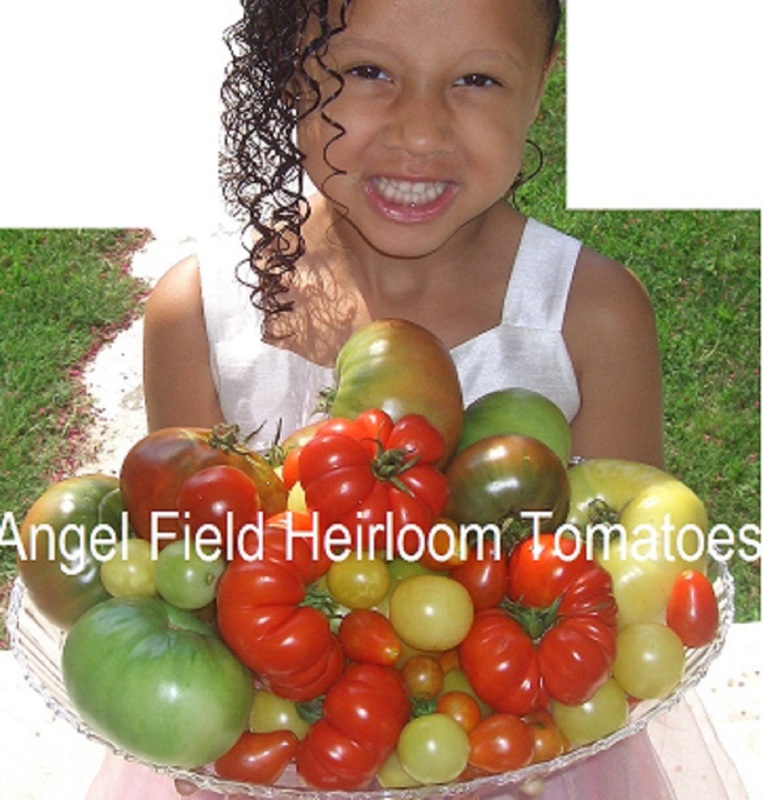 Mixed Heirloom Tomato Seeds "30 Seeds Special"
Learn to grow historical tomatoes before you invest. Most historical tomaotes grow over 10 feet. My historical tomatoes seeds give you the time to learn to grow these beautiful tomatoes. 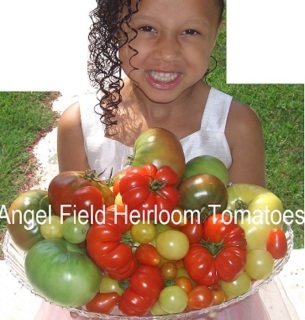 Angel Field Heirloom Tomatoes seeds are a mix of over 30 varieties of Heirloom tomatoes grown in Hampton Virginia to give everyone the needed opportunity to enjoy these beautiful Heirlooms Tomatoes, during these hard economic times. Your new venture of growing heirloom tomatoes for the first time will save your money while you learn. My Heirloom Tomatoes Seeds are not separated, but combined together to enjoy a beautiful surprised of Rainbows Heirlooms, at a "Very" low cost of growing many different varieties, to including cherry tomatoes. Red Brandywine, Black Bell, Ace 55, Kentucky Orange , Red Homestead, German Johnson, Cherokee Purple, Watermelon Beefsteak, Pineapple, Beefsteak, Mortgage Lifters, Pink Brandywine, Great White Beefsteak, Small Red Cherry, Amish Salad Cherry, more..
a saving of $ 30.00. Please Share your Vegetables Knowledge With Us. Native Americans and Contraband Slaves Farm Land from 1879 After the Civil War. Who is the Honorable George Washington Carver? He was one of the 20th century's greatest Scientist born as a “Proud Field Biologist as a Child who had his own small garden, because he was just too small to work in the fields. As a child just loving every part of agriculture as he talked to his plants, who group up to be the World Greatest Scientists. Rising from slavery to become one of the world's most respected and honored men. He’s influence on all areas of Agriculture and studies of Heirloom Plants, is still being felt today in universities all over the World. His devoted his life to understanding nature and the many uses for the simplest of plant life is still being felt by farmers like me. He is best known for developing crop-rotation methods for conserving nutrients in soil and discovering hundreds of new uses for crops such as the peanut. As I interviewed many Natives Hawaiians about their Taro Plant, I visited the University of Hawaii to see the Taro plant grow in its own natural environment. The first farming method I notice were the field layout for “Crop Rotation” as I was over joyed “just to see the Taro Plants growing with my own eyes. Washington Carver was also an inventor Born July 12, 1864 in Diamond Grove, Missouri and Died were he work January 5, 1943 in Tuskegee, Alabama Because of his frailty, George was not suited for work in the fields but he did possess a great interest in plants and was very eager to learn more about them. Here on the farm is where George first fell in love with plants and Mother Nature. He had his own little garden in the nearby woods where he would talk to the plants. He soon earned the nickname, The Plant Doctor, and was producing his own medicines right on the farm. George's formal education started when he was twelve. He had, however, tried to get into schools in the past but was denied on the basis of race. No black school was available locally so he was forced to move. He said Good-bye to his adopted parents, Susan and Moses Carter, and headed to Newton County in southwest Missouri. Here is where the path of his education began. He studied in a one-room schoolhouse and worked on a farm to pay for it. He ended up, shortly after, moving with another family to Fort Scott in Kansas. Though denied admission to Highland University because of his race, Carver gained acceptance to Simpson College in Indianola, Iowa, in 1890. He became well respected for his artistic talent (in later days his art would be included in the spectacular World's Columbian Exposition Art Exhibit.) Carver's interests, however, lay more in science and he transferred from Simpson to Iowa Agricultural College (which is now known as Iowa State University.) He distinguished himself so much that upon graduation in 1894 he was offered a position on the school's faculty, the first Black accorded the honor. Carver was allowed great freedom in working in agriculture and botany in the University's greenhouses. In 1895, Carver co-authored a series of papers on the prevention and cures for fungus diseases affecting cherry plants. In 1896 he received his master's degree in agriculture and in 1897 discovered two funguses that would be named after him. Later that year Booker T. Washington, founder of the Tuskegee Institute, convinced Carver to come south and serve as the school's director of agriculture at Tuskegee Institute. .
At Tuskegee, Carver developed his crop rotation method, which alternated nitrate producing legumes-such as peanuts and peas-with cotton, which depletes soil of its nutrients. Following Carver's lead, southern farmers soon began planting peanuts one year and cotton the next. While many of the peanuts were used to feed livestock, large surpluses quickly developed. Carver then developed 325 different uses for the extra peanuts-from cooking oil to printers ink. When he discovered that the sweet potato and the pecan also enriched depleted soils, Carver found almost 20 uses for these crops, including synthetic rubber and material for paving highways. The farmers were ecstatic with the tremendous quality of cotton and tobacco they grew later but quickly grew angry because the amount of peanuts they harvested was too plentiful and began to rot in overflowing warehouses. Within a week, Carver had experimented with and devised dozens of uses for the peanut, including milk and cheese. In later years he would produce more than 300 products that could be developed from the lowly peanut, including ink, facial cream, shampoo and soap. Carver did not stop with these discoveries. From the inexpensive pecan he developed more than 75 products, from discarded corn stalks dozens of uses and from common clays he created dyes and paints. Suddenly Carver's fame grew and grew until he was invited to speak before the United States Congress and was consulted by titans of industry and invention. Henry Ford, head of Ford Motor Company invited Carver to his Dearborn, Michigan plant where the two devised a way to use goldenrod, a plant weed, to create synthetic rubber. Thomas Edison, the great inventor was so enthusiastic about that he asked Carver to move to Orange Grove, New Jersey to work at the Edison Laboratories at an annual salary of $100,000 per year and state of the art facilities. He declined the generous offer, wanting to continue on at Tuskegee. He continued constantly working with peanuts, sweet potatoes, and pecans trying to produce new products. He developed more than 300 products from the peanut (including Peanut Butter), 175 from the sweet potato, and 60 from the pecan. He extracted blue, purple, and red pigments from the clay soil of Alabama. He researched the manufacture of synthetic marble from green wood shavings, rope from cornstalk fibers, and veneers from the palmetto root. During WWI, he worked to replace the textile dyes that were being imported from Europe. He ended up producing and replacing over 500 different shades. In 1927, he invented a process for producing paints and stains from soybeans. Although he did hold three patents, Carver never patented most of the many discoveries he made while at Tuskegee, saying "God gave them to me, how can I sell them to someone else?" Three different patents were issued: US 1,522,176 Cosmetics and Producing the Same. Jan. 6, 1925 George Washington Carver. Tuskegee, Alabama. US 1,541,478 Paint and Stain and Producing the Same. June 9, 1925 George Washington Carver. Tuskegee, Alabama US 1,632,365 Producing Paints and Stains June 14, 1927 George Washington Carver. Tuskegee, Alabama. In 1935 he was appointed collaborator in the Division of Plant Mycology and Disease Survey of the Bureau of Plant Industry of the U.S. Department of Agriculture. By 1938, peanuts had become a $200 million industry and a chief product of Alabama. Carver also demonstrated that 100 different products could be derived from the sweet potato. In 1940 he donated over $60,000 of his life's savings to the George Washington Carver Foundation and willed the rest of his estate to the organization so his work might be carried on after his death. George Washington Carver died on January 5, 1943 on the campus of Tuskegee Institute. He was honored by various levels of State and Federal Government as well as by foreign leaders worldwide. The United States government designated the farmland upon which he grew up as a national monument and on January 5, 1946 as George Washington Carver day. He was truly a pioneer in his field and has become one of the few Black inventors recognized by mainstream America. He was elected a Fellow of the Royal Society of Arts, Manufacturers and Commerce of Britain in 1916, the Spingarn Medal from the National Association for the Advancement of Colored People in 1923, and in 1939 was awarded the Theodore Roosevelt Medal for "distinguished research in agricultural chemistry." Man of the Year in 1940 by the International Federation of Architects, Engineers, Chemists and Technicians. Finally, he received honorary Doctor of Science degrees from Simpson College as well as the University of Rochester. In 1990 he was inducted into The National Inventor's Hall of Fame for his accomplishments.